Finally, some proper autumn weather for a hunt test. The NV Brittany Club's all-breed pointing dog test was held at the McKee-Beshers preserve. First brace of the day, and handler enters the master bird field with his Weimaraner. The gunners and a handler hash out how to handle a difficult bird position. The Weim's already got it all figured out. And up goes the quail, exit stage right. For this brace, one judge is on foot, and the backing handler is down with his dog. Weim on point, handler eyeing the situation. The pointing dog stays steady as a gunner moves into position. 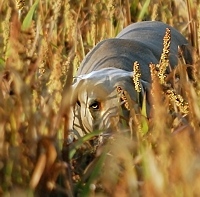 As the Weim stays on point, the handler follows his dog's nose into the cover to kick up the hidden bird. These animals are our companions, but they're still predators. Just think of it from a quail's point of view. 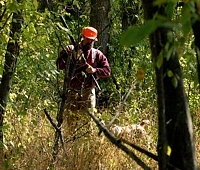 A handler, with prop-shotgun in hand, kicks up a quail in front of his shorthair, a gunner, and a judge. While the working Weim cuts across the field on a retrieve, his backing GSP bracemate has a patient chat with his handler. On the sidelines, between braces, this senior citizen is given a chance to retrieve a tossed chukar from the field. That was fun! He's found some far more lively birds in crates at the side of the field. Full points for a good club seal! This Shorthair slams to a halt as he comes around a bit of cover and picks up bird scent. That "cone" of scent starts at the bird, and gets wider for yards. This Viszla keeps his nose on the bird while his handler works to flush it. Judges and gunners watch carefully. That steadiness paid off, and the Viszla makes a nice retrieve right past the judges. Another nice point from a Weim in the brambles. A handler raises his hand as he calls out to the judges to make sure his Weimaraner's point is being observed. In a senior test, the handler is allowed to caution his dog when the pressure's on. The Weim's steady to flush. The working dog stays steady as the gunner takes his shot at the bird. And it's the perfect hunt test bird shot - cleanly dropping the bird in workable cover at a good retrieving distance. Taking up the gunner on his offer, the Weim retrieves the chukar to hand. It's hard to believe a pointing dog can catch scent while moving like this, but they do. This shorthair is cornering hard to get back into the cover he thinks hides a bird. Two handlers make their way through the last bit of the back course, their dogs out in the cover. She's got her blank gun ready for a flush. The mounted judges are twenty yards behind, watching how the dogs hunt and respond to their handlers. Out in front of the party, the dogs work the rows of cover. The Griffon is tall enough to see over most of the milo. Once the judges have called time to end the brace's run, it's good form to leash the dogs on the way out of the field. There are usually still birds down that can be used by the next brace. With the test over, the course's bird planter fetches his patient Brittany from the truck to work some leftover birds. Bang! Right onto point he went. Steady as a rock, watching a quail flush up from the cover. Ol' Luke, here, is very happy to finally get down to real business. The Brittany hunts and points, and then his Lab DNA kicks in once that bird is down in the cover. Still retrieving after all these years. The more predictable field situation just after a hunt test is a great chance for a young hunter to gain some experience. He doesn't get to keep that Parker side-by-side, though, no matter how well he shoots. By the end of the day, many of the flushed birds have found their way into the woodlines at the edge of the field.